Pakistan coach wants improved performance when side next face big rivals India on Sunday in the UAE. Asia Cup now down to Super Four stage. 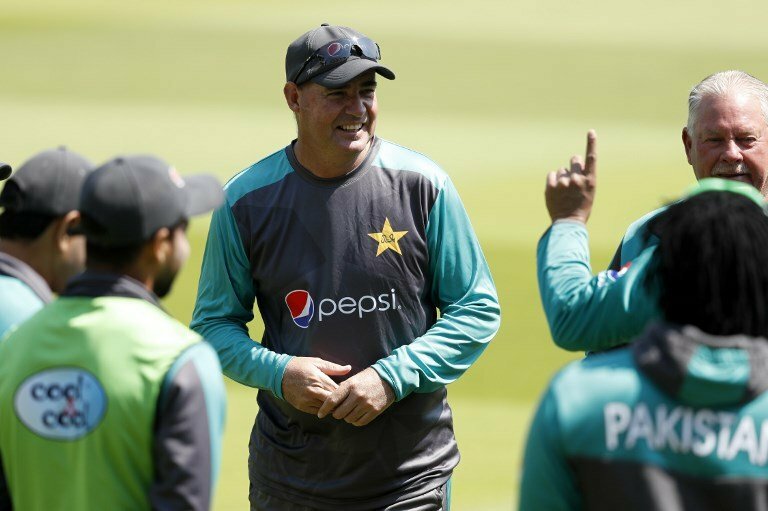 LONDON: Mickey Arthur is confident Pakistan can bounce back from their big defeat against India in Dubai on Wednesday. Arthur’s side lost by eight wickets to their arch-rivals in the final clash of the group stage at the Asia Cup, taking place in the UAE. It came less than 24 hours after India struggled to beat Hong Kong, but Rohit Sharma’s side hit the disappointment of that performance for six to easily beat Pakistan. Despite the defeat Arthur is sure his side can turn things around in the Super Four stage and go all the way and win the tournament. “Whenever we go head-to-head with India, I am comfortable that we’ve got a dressing room of players who can stand up to it,” the Pakistan coach said. Pace spearhead Bhuvneshwar Kumar (three for 15) and part time off-spinner Kedar Jadhav (three for 23) sent Pakistan, who won the toss and batted, collapsing to just 162 all out in 43.1 overs at the Dubai International Cricket Stadium. Skipper Sharma then struck three sixes and six boundaries in his 39-ball 52 while fellow opener Shikhar Dhawan hit a six and six fours in his 54-ball 46 as India romped home in just 29 overs. Ambati Rayudu and Dinesh Karthik both finished on 31 not out as India exacted some revenge for their humbling 180-run defeat against their arch-rivals in the final of the Champions Trophy in London last year — the most recent match between the teams until Wednesday. Pakistan coach Mickey Arthur was not a happy man after watching his Pakistan side soundly beaten by India in Dubai. Both Pakistan and India had already qualified for the Super Four stage of the Asia Cup and will meet again in Dubai on Sunday. When they do Arthur will doubtless be looking for a response and for his side to stick to the set plans. “On a wicket like that you need to strike really if you’re going to defend it. We didn’t strike early enough,” Arthur said. “We went away from our plans too quickly. We said that our batters batted outside our roles and that wasn’t acceptable. With our bowling, we went outside our plans far too quickly. We wanted to bowl hard lengths, hit the top of off stump. “It was tough to score then. We did that in the first six, and then (Usman Khan) Shinwari decided to come around the wicket and bowl a bouncer with fine leg up. And from there it just tumbled. “We’re going to sit down and talk about that. It’s not good enough. We went outside our plans. Also of concern to the Pakistan coach is the form of Mohammad Amir. The side’s main bowler has looked out of form recently and has struggled for wickets since last year’s Champions Trophy win. “I’d be lying if I sat here and said there wasn’t (any concern about Amir),” Arthur said. “I had a really good, long hard chat with him last night and I thought he came out and bowled really well. He hit the crease really hard. He ran in well. He’s been decelerating to the crease, but he didn’t do that today. There was much hype surrounding the clash, as there always is with any India vs. Pakistan match, but once Pakistan’s unpredictable batting crumbled, Wednesday’s showdown turned into a damp squib for a near-capacity crowd in the UAE. They will all hope that Sunday’s rerun will dish up more drama and entertainment.